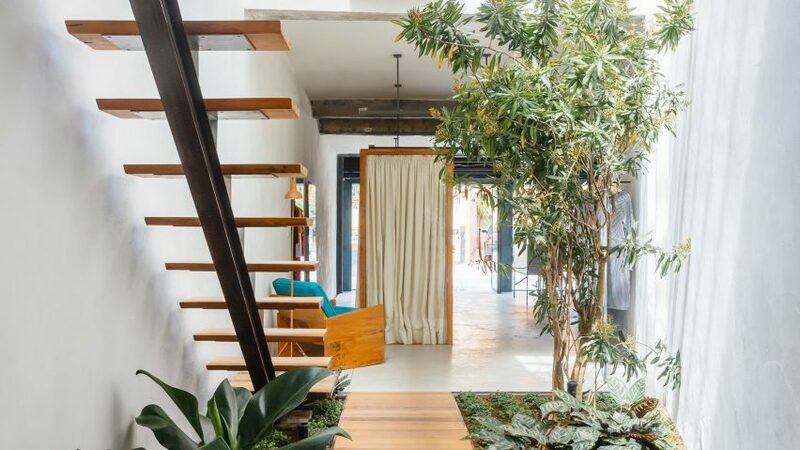 An opening in the roof sheds light on this concrete-lined boutique in São Paulo, which Brazilian studio Vão Arquitetura has designed around a lush indoor garden. 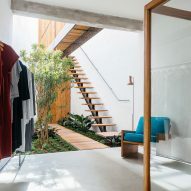 The Acolá store, located in the Pinheiros area of the city, is set inside a peculiarly shaped townhouse, which gets narrower towards its rear. 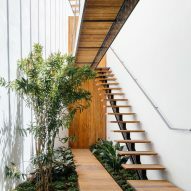 Before their renovation, the Vão Arquitetura team described the three-storey space as being damp and dark – with only four windows running along its main facade. 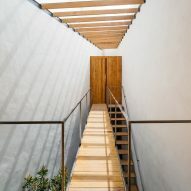 Bringing light into the property became their main mission, and they did so by creating an opening in the roof and partially removing the upper-level slab. "The desire to bring light into the store guided the first design decisions of replacing a part of the compromised structure with a glass ceiling and visually integrating the levels through partial demolition of the upper slab," said the architects. 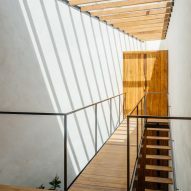 "In addition to lighting the entire store, the cover provides for the exchange of natural ventilation that, added to the internal garden, brings great thermal comfort to the space." 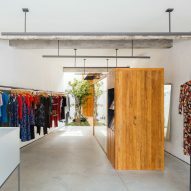 Visitors enter the store at street level where they are met with an open shopping space with polished concrete floors and wooden fixtures. In the middle of this floor there is a free-standing volume encompasses a shelving unit to display books and accessories, as well a changing room area. The changing area has two pivoting doors, which can be moved to split the space up into as many fitting rooms as needed. 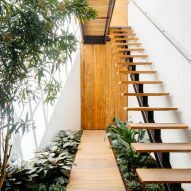 "The fact that it is a free volume, without touching the ceiling or walls, allows the circulation between these environments to be fluid and uninterrupted," said the architects. 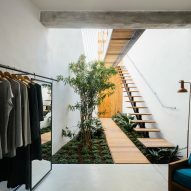 A staircase towards the narrow, rear end of the store leads customers upstairs to a mezzanine level, via an indoor garden. 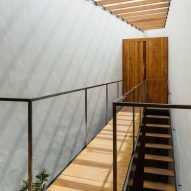 This floor, accessed by a wooden walkway, houses a bathroom and an office area for staff. 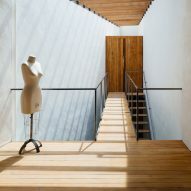 Huge windows on the store's facade allow for plenty of natural light. 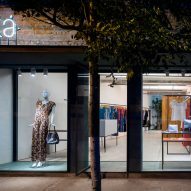 Throughout the entire store, Vão Arquitetura opted to use a simple material palette made up of wood and metals – reflective of Acolá's approach to clothing design. 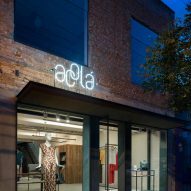 "The decision to use them in a natural state is related to the clothes produced by Acolá, which are largely natural fabrics with craft techniques of dyeing and stamping," said the studio. 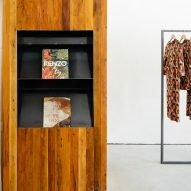 "All the woodworking that uses the demolished peroba rosa wood, as well as parts of the metalwork, were made in the fashion stylist's farm in the countryside, using local machinery and labour," it continued. 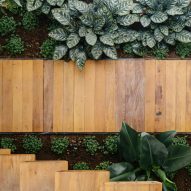 Architects are increasingly integrating plants into homes, shops and restaurants in the form of glazed atriums, walls covered in flowers and indoor courtyards filled with trees.